English Summary/英文概要： Dyslexic learner and teacher Alais Winton shows the positives of being dyslexic, and makes learning (and even spelling!) fun, with games and activities to make school learning simple. An inventive and practical book for children aged 7 to 13 who have been identified as having dyslexic tendencies, this book contains practical and creative activities for kids and teens to use, such as Spelling Sculptures and Hear it, Sing it, Beat it! The games and activities use the four different learning styles that work best with dyslexics - thinking in pictures, in movement, in music or socially. 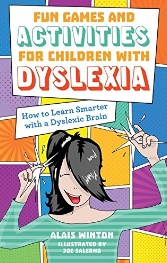 With funny cartoons, which appeal to visual thinkers, and a section with advice on how parents and guardians can aid learning, this is an essential toolkit for any dyslexic child. About the Author/作者介绍： Alais Winton is a private tutor working with dyslexic children in Wales. She has taught on several further education programmes, as well as teaching adult learners on PGCE courses. As a dyslexic teacher and learner herself, Alais has collated and researched techniques to assist dyslexic learners in education.